I woke up a bit late; the room is very dark and makes it easy to snooze. I did not bother to shower. I’m working from home today. Instead, I worked with the kids, helping with breakfast, diaper changes, etc. I needed to get out early since Big Bro wanted to scooter to school today. I would have to do that with him, walk the Twins to daycare, and then rush back for a 9 AM conference call. So I was still under the gun this AM. Twins were up and eating, but Red and Big Bro were still upstairs playing. What??!?!?? Our rule is that they must eat and get dressed before they play with toys. I need to go up there more often to make sure they are not sneaking play time in. It SERIOUSLY disrupts the routine. Everyone ate well; everyone got dressed AOK. We were out at a decent time. Hubby dropped of Red, but I reminded her that I was going to “steal” her before her lunch to take her to the doctors. Nothing serious… her feet are a little pigeon-toed but I wanted to get that checked out in case it was anything we should be concerned about (it is nothing by the way, at least for now – probably something she will grow out of — her hips are straight – whew)..
We were off! We randomly met up with the Motley Crew and rode with them. Within 1 minute Big Bro fell on his scooter since the ground was slippery. All of the kids were concerned and asked him if he was OK. They are really good kids. He was fine, but scared. And embarrassed, I think. He walked with me the rest of the way. After the Big Bro drop off I ran the Twins to daycare, left the stroller there, and practically ran the whole way back (again, good exercise). I made it just in time for my 9 AM call. related to another forum that we could potentially be launching. There is a lot of excitement around this and we are in process of recruiting industry sponsors and planning for a big meeting in April. If this gets launched, it could be something that I would be very proud of professionally. I’m excited about it. Afterwards I followed up on some items related to the call, and also some issues in my email that I had to get to. I then packed up to get Red. 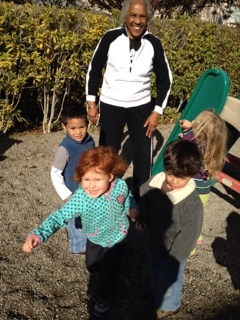 Red was playing and enjoying herself in the playground when I came to pick her up. Her teachers are wonderful. Red did not see me at first … but to see her playing with her friends and to see her pure joy is so wonderful – she caught my eye and then came running over to me – I love those embraces…. running at full steam, face all smiles with a look of determination, and then a small body plowing into mine and grabbing hold of my legs and looking up at me with her face. I love it. 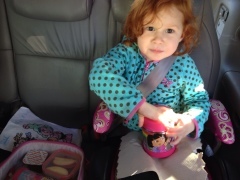 I got her set up in the minivan with her lunch so she could eat it on the way there. She talked about napkins and how she needed them to wipe her face. We were off! The doctor visit was uneventful. We read books and looked at the colors of cars from out the window while we were waiting. She fell asleep on the way home; I picked her up and put her in my room for her nap. 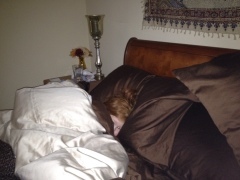 She woke up briefly and was all smiles, cuddled deep into the abyss of my sheets. I re-worked a proposal for a client project and looked at the budget; it is due next week. We are in good position to win this one. The proposal needs a bit more work but I sent it out to the team by 5 PM so we can talk about it in the morning. Although Thursday is not a typical working day for me, tomorrow will be since we are having a day long internal strategy session. So I will go to the office and might as well make a full day of it. Part of the part-time gig deal with my bosses was that I would be flexible when needed – so flexible I am!!! I want this arrangement to be successful for me and the company. 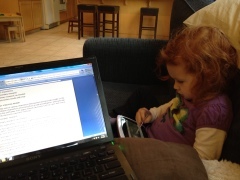 While I worked, Red was “working” on her LeapPad. We were buddies working together. I picked up Big Bro and the Twins with Red. Before we left, Red needed to hug me for a bit. She sat embraced with me, and she started the rocking motion that we do together – in silence. Her body was pulling mine back and forth – I pulled her on top of my lap and we sat there for 10 minutes or so just rocking in silence. I think this fills up her “mommy time” tank when she needs it. Or, it at least helps. Dinner was fine, but interrupted by the arrival of Big Bro’s Star Wars sheets. I never saw a kid so excited to see a big box before and help to rip it open. I quickly got the sheets into the washing machine so he could have clean fresh new sheets for bed tonight. 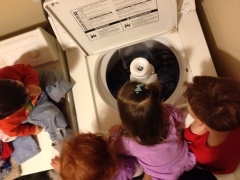 All five of us looked at the sheets in the washing machine – and we were teaching Twin Crazy and Twin Husky about the washing machine and how it works – how the water comes in with the soap and how the clothes go around and around until they are clean. They all really got into it. I remember doing the same with Big Bro and with Red when they were smaller. It must be something about the humming of the machine, the flow of the water, and the motion that really mesmerizes the kids. It was fun doing this with all of them. Twin Husky was busy doing chores. 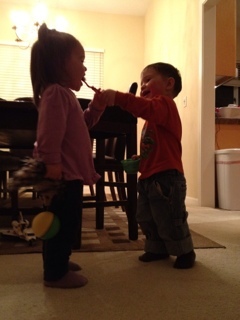 First we saw him brushing Twin Crazy’s teeth. 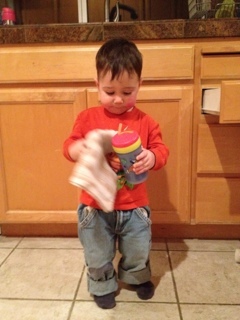 Then I witnessed him cleaning up his drinking cup and floor with a towel. So cute. 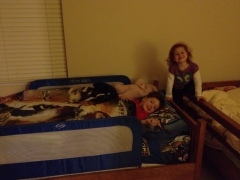 Kids got cranky – Twins were banished to their rooms for bed. I folded laundry with Big Bro and Red while waiting for the sheets to dry. 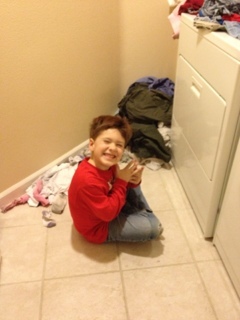 Red was very helpful, folding the clothes and putting them in the right piles. Bedtime with Big Bro and Red was dicey. Red refused to brush her teeth so I had to get involved. Big Bro and Red were awesome about getting the new sheets on the bed. Big Bro didn’t want to go pee pee when I asked him so there was a bit of a power-play there. I read The Tale of Peter Rabbit without him next to me and then left him lying on the floor, after covering him with his old blanket. I later checked in on them out of guilt and he was in bed, so loving his new sheets. I kissed them both and they bid their farewell to me on my way out. Today was very, very, very busy. I was seriously running from the time I got up until now. I guess it goes to show you how I really can’t split up my day – work, personal, work. It’s just too hard. It’s best to keep the work from 9 – 1, and then have the rest of the day to myself and my kid(s). This is a key learning that I need to remember going forward. Red is sitting with me in my bed since she was “scared” upstairs. We’re eating mini-wheats together. It’s so late, and she’s still my little buddy today.